The 24-Hour Mommy: Magnolia Frozen Delights will make your summer cool! Magnolia Frozen Delights will make your summer cool! We had a Magnolia Ice Cream man in our school when I was in grade school. Mang Mike, as we fondly call him, became a school icon of sorts and his name comes up every time I get a chance to chat with former classmates and schoolmates. I often bought Twin Popsies from him because it was the cheapest my measly allowance could afford. But when my budget allows me, I'd go for the Pinipig Crunch! If you are a child of the 80s just like me, you'll definitely be familiar with Magnolia Ice Cream Frozen Delights. Magnolia Ice Cream is, once again, introducing its line of Frozen Delights this summer. 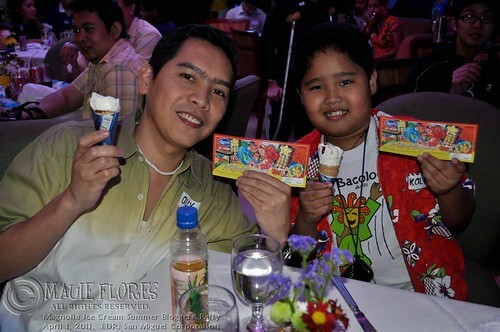 I and my boys were blessed to have been invited to the Magnolia Ice Cream Summer Bloggers' Party held last Friday where we had the chance to taste these cool and yummy frozen treats! Magnolia Ice Cream gift checks they won in the raffle. 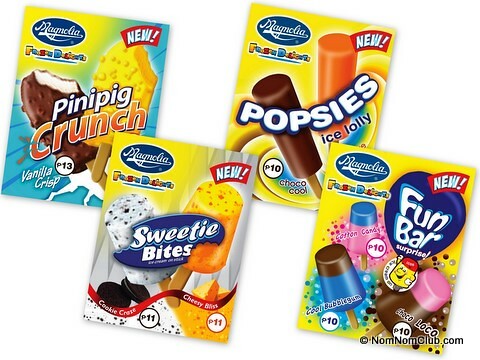 Popsies Ice Lolly - Comes in "Choco Cool" and "Orange Chill" and which are sold at only Php 10 each. Fun Bar Surprise - With "Cool Bubblegum", "Cotton Candy", and "Choco Loco" flavors which will surely be the fave of kids and kids at heart for only Php 10 each. Sweetie Bites - Enjoy "Cookie Craze" annd "Cheesy Bliss" ice cream on sticks for only Php 11 each. Pinipig Crunch - "Vanilla Crisp" and "Sweetcorn" coated ice cream with delightful rice crispies sold at Php 13 each. Spinner - "Chocolate" and "Vanilla" ice cream cones with chocolate ripples sold for only Php 20. So cool down this summer with Magnolia Ice Cream Frozen Delights. To be updated with their latest products, don't forget to visit the Magnolia Ice Cream website and the Magnolia Ice Cream Facebook page. Check more of the photos from the party here.